The artwork is an artistic and scientific collaboration between artist and daughter Kate Kendall, geologist and father Jerry Kendall, and their communities with support from the Buffalo Bayou Partnership and funded in part by the City of Houston through the Houston Arts Alliance. 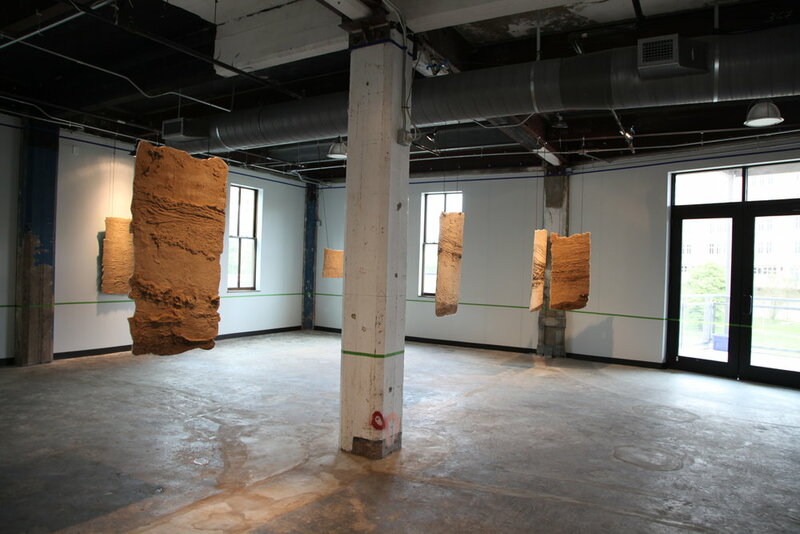 Two sand peel sculptures were also on view through November 3 in Seeing Harvey, an exhibition of personal stories and public responses at Fotofest International along with photographs taken by Jan-Claire Phillips of Buffalo Bayou Park when the first sand peels were collected in October 2017. Emerge: Fluvial Tapestries from Hurricane Harvey runs Friday October 26, 2018 through November 15, 2018 at the Buffalo Bayou Park Sunset Coffee Building Gallery. 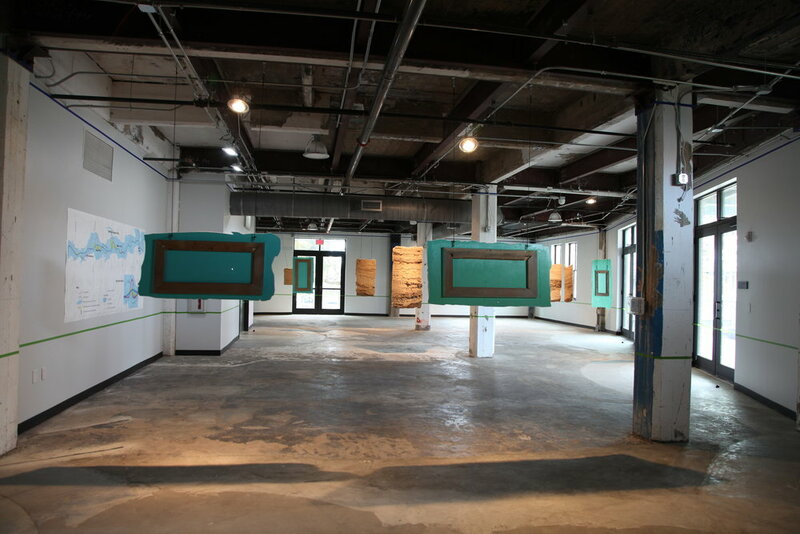 Learn more about the exhibition at BBP Events or HAA Cultural Events Calendar. Buffalo Bayou is an ever-evolving fundamental feature of Houston, TX. It has and always will change and adapt to its surroundings. The bayou responds to both natural and artificial changes imposed on it, eroding in one place and depositing sediment somewhere else. Hurricane Harvey was one of thousands of such events that Buffalo Bayou has experienced. 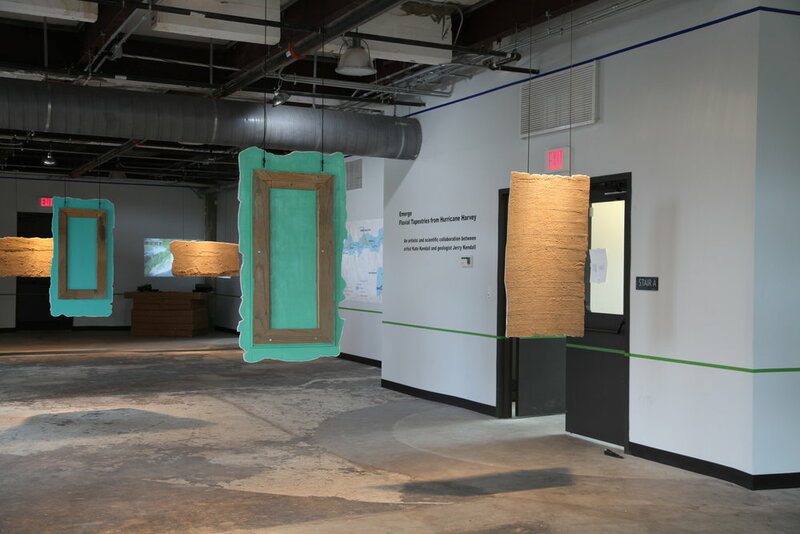 Emerge: Fluvial Tapestries presents a natural narrative of Hurricane Harvey in relation to Buffalo Bayou’s water levels and the sediment deposits left after the storm. 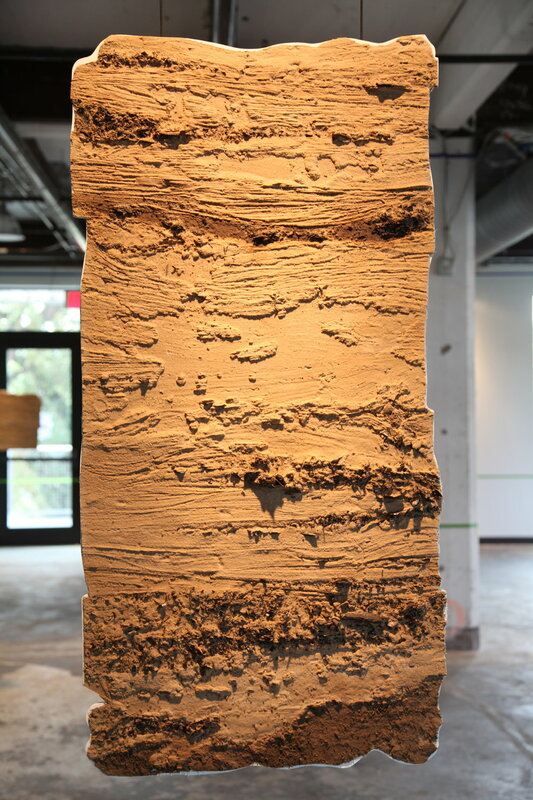 From October 2017 to June 2018 a team of artists and geologists working in communication with the Buffalo Bayou Partnership and the University of Houston Department of Earth and Atmospheric Sciences collected 12 sand peels from sediment deposits left by Hurricane Harvey in Buffalo Bayou Park. 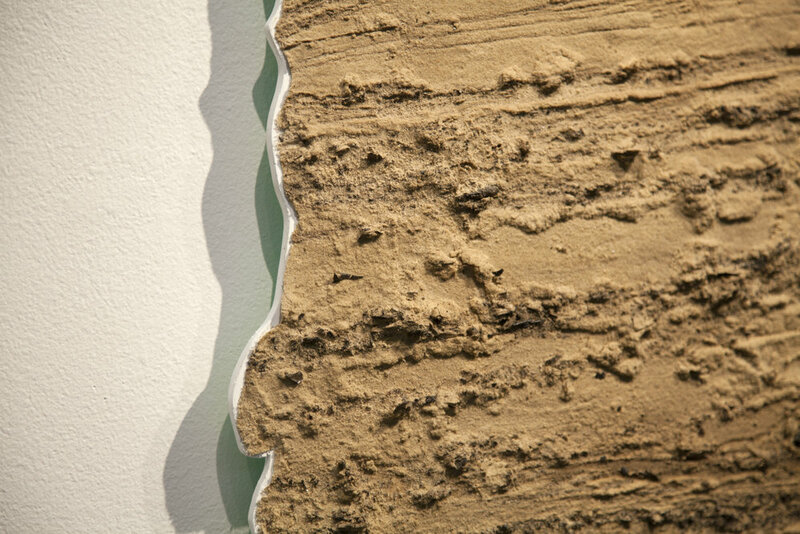 A sand peel is a geologic science tool used to capture and read sediment deposit patterns. These natural sand tapestries are a record of Buffalo Bayou’s reactions to Hurricane Harvey. 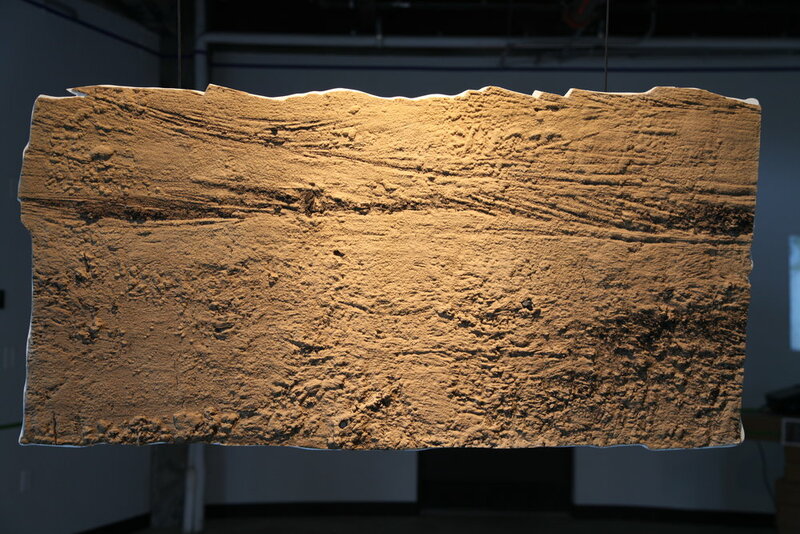 The sedimentary structures and layers visible on each sand peel are the result of the evolving energy levels and sediment load carried by Buffalo Bayou as water unleashed by Hurricane Harvey flooded and receded from Houston. The layers tell the story of flooding, adjustment, and recovery from the storm. The frames for the sand peel sculptures are made from recycled wood debris collected after Hurricane Harvey. 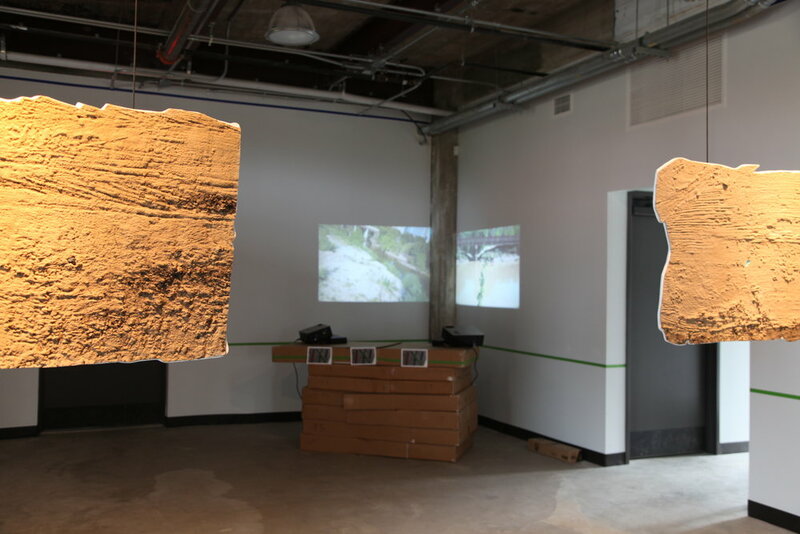 The sculptures are complemented by water marks on the walls of the gallery that illustrate the timeline of events during Harvey flooding and a video that documents the efforts to restore the park, the current flow and use of the Bayou, and the surrounding landscape of Houston, Texas. Special THANKS to the Buffalo Bayou Partnership, especially Anne Olson, Trudy Smith and Robbie Robinson, The University of Houston Department of Earth and Atmospheric Sciences, especially Joel Saylor and Erin Miller, Charlie and Linda Beeman, Tom Byrd (Buffalo Bayou Air Force), Dixie Friend, Ky “the boxer” Cooksey, Box Superstore, Mina Gaber, and Jan-Claire Phillips for their generous support of this project. This project is funded in part by the City of Houston through the Houston Arts Alliance. 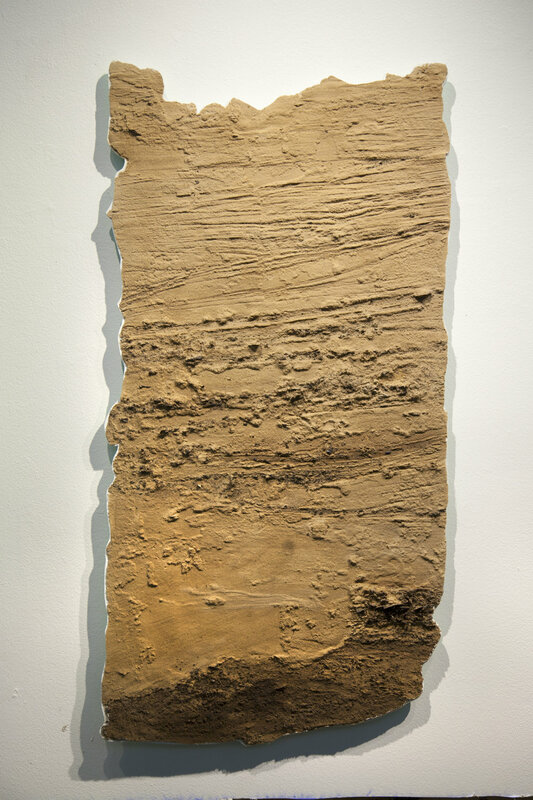 All 12 sand peel sculptures will be exhibited as part of Emerge: Fluvial Tapestries from Hurricane Harvey. The exhibition runs Friday October 26, 2018 through December 1, 2018 in the Buffalo Bayou Park Sunset Coffee Building Gallery. Opening reception Friday October 26, 2018 6:00 – 8:00pm. Meet at The Kitchen at The Dunlavy at noon.